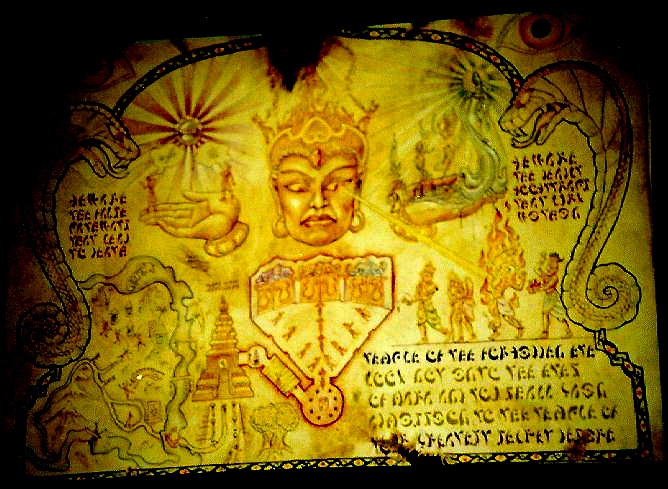 Locating the Temple of the Forbidden Eye. This ancient scroll wound upon two staves crested with golden snakes, which lies on Indy's desk, helped lead Indiana Jones to this Temple. Its lower left corner has been restored thanks to the help of Salah's brother-in-law in the dangerous yet lucrative black market. That missing portion contained an index the starting point of the journey, without which we couldn't begin to search for the temple's actual location. "Temple of the Forbidden Eye"
"Look not into the eyes of Mara and you shall gain admission to the temple of your greatest secret desire."